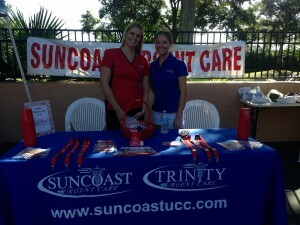 Suncoast Urgent Care Sponsors 3rd Annual Cheval Cares! 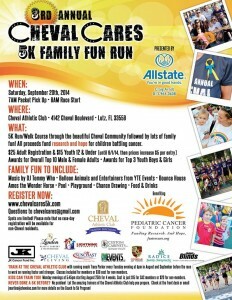 Suncoast Urgent Care Centers, LLC is proud to once again be a sponsor for the 3rd Annual Cheval Cares 5K Family Fun Run. All proceeds from the 5K event will go to the Pediatric Cancer Foundation which "provides research and hope for children battling cancer." Registration Fee: $25 Adults $12 Youth (12 & under) After September 1st add $5 per entry. Only Cheval residents may register same-day. We'd love to have you join us in supporting the fight against childhood cancers! Space is limited. Sign up today! 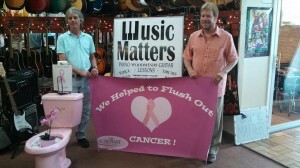 The pink potty spent some time Saturday at Hair Masters in Trinity Thank you, Hair Masters! October 12, 2013. 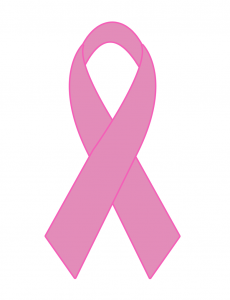 Hair Masters supports the fight against Breast Cancer! They support Susan G. Komen with "Flush out Cancer!" and Clip for the Cure: Saturday, Oct. 19th: 10% of the proceeds from every haircut will go to the Regis Foundation for Breast Cancer Research. Thank you to the businesses that supported "Flush out Cancer! 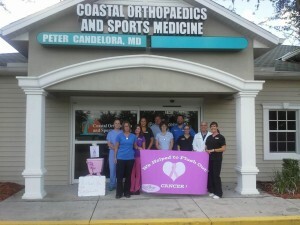 ", New Port Richey the week of September 27th to open Breast Cancer Awareness month and to support Susan G. Komen. A list of businesses who participated is listed below and additional photos can be found in the blog "Where in New Port Richey is the Pink Potty?" We at Suncoast Urgent Care will collect the tax deductible donations and send them to Susan G. Komen in support of Erica and Tabetha, two of our employees who are hoping to raise the $2300 needed for each to participate. Contact Erica Cuevas or Tabetha Beadling at our Spring Hill office (4112 Mariner Blvd) for more information: 352-684-3288. Thank you to The Miele Family for your generous donation to Susan G. Komen! WE WOULD ALSO LIKE TO THANK THE FOLLOWING BUSINESSES FOR THEIR PARTICIPATION, DONATIONS AND SUPPORT! FRIDAY'S 5PM - 9PM "EAT WINGS, RAISE FUNDS"
"Eat Wings, Raise Funds" @ Buffalo Wild Wings Fridays in Trinity! Proceeds to Susan G.Komen! 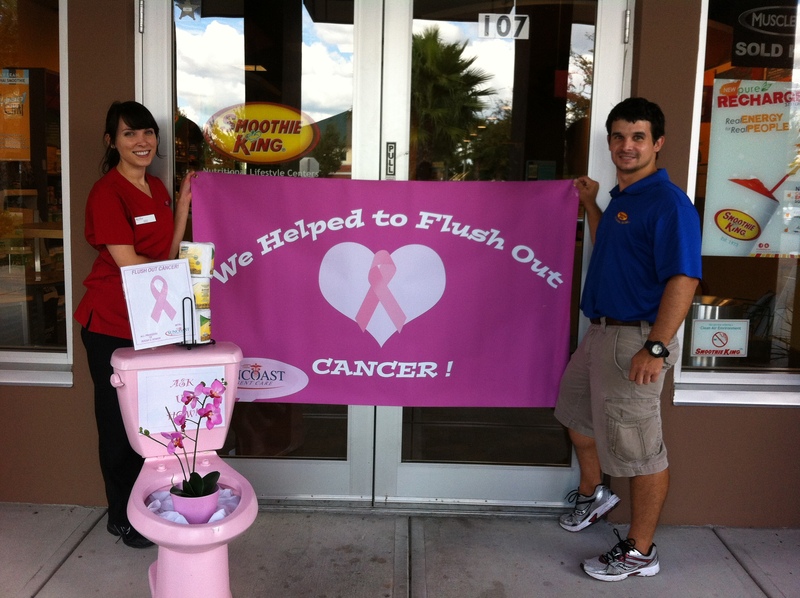 Suncoast Urgent Care is excited to thank Buffalo Wild Wings on SR 54 inTrinity for partnering with us to help “Flush out Cancer!”Buffalo Wild Wings will donate 15% of their sales on Fridays from 5pm - 9PM to Susan G. Komen. So head over to Buffalo Wild Wings, enjoy some wings and good fun and help fight breast cancer! HOW? 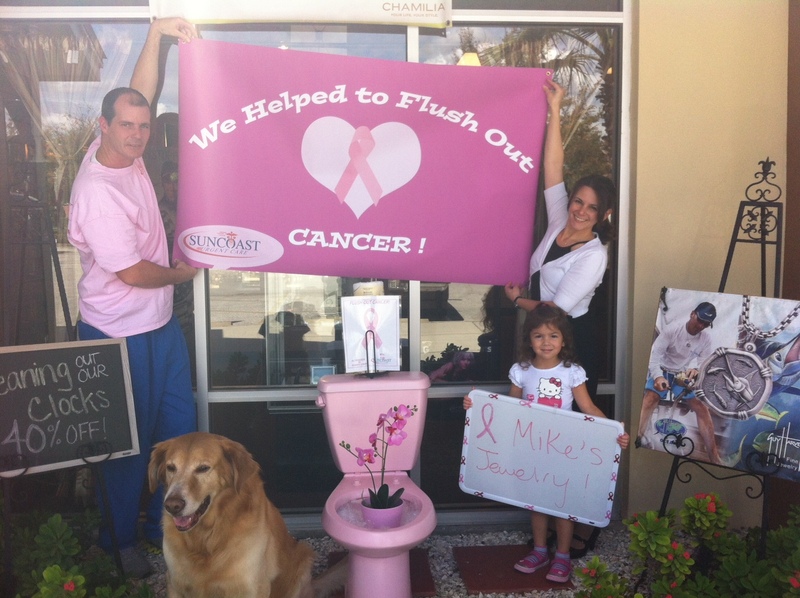 Mention to your server that you’d like to help raise funds for Suncoast Urgent Care’s “Flush out Cancer!” and 15% of your bill will go to Susan G. Komen. October 2013. 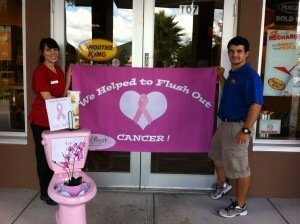 Having fun at Buffalo Wild Wings while helping to "Flush out Cancer!" October 2013. 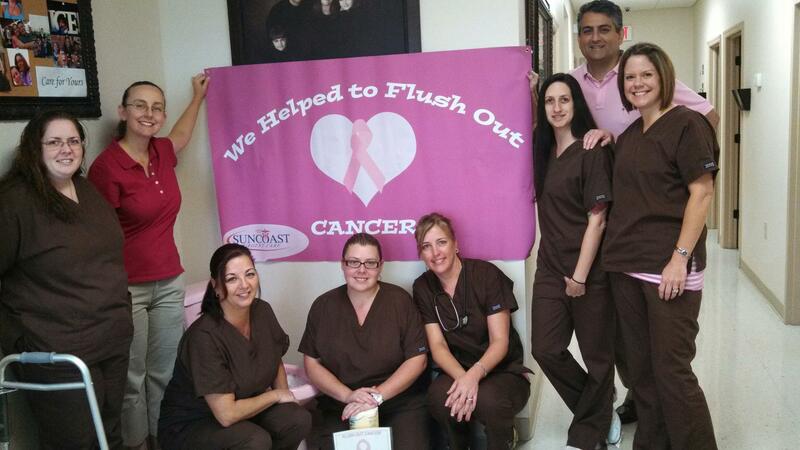 "Flushing out Cancer!" at Buffalo Wild Wings. 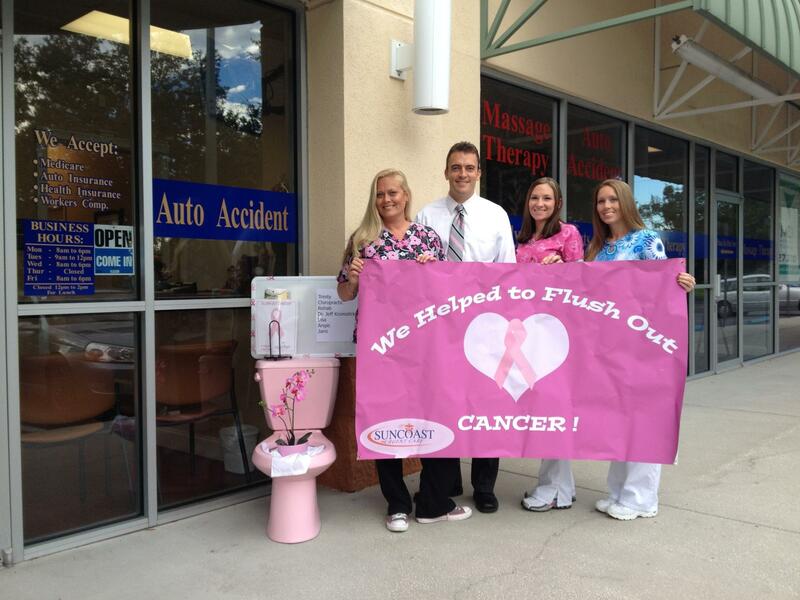 WHERE IN NEW PORT RICHEY IS THE PINK POTTY? 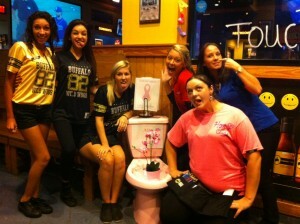 The Pink Potty was at Buffalo Wild Wings in Trinity. 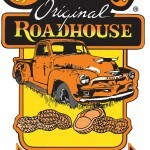 "Eat Wings, Raise Funds" with proceeds to Susan G. Komen. October 4, 2013. Pink Potty at Smoothie King in Trinity. Thanks for supporting Susan G. Komen! October 3, 2013. 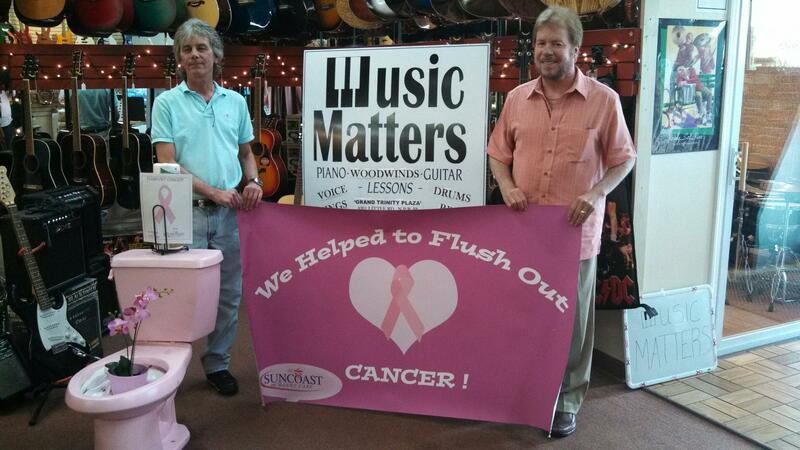 Music Matters supports Susan G. Komen through Suncoast UrgentCare's "Flush out Cancer!" campaign. Thank you, Music Matters! October 1, 2013. Pink Potty Paparazzi at Anytime Fitness. 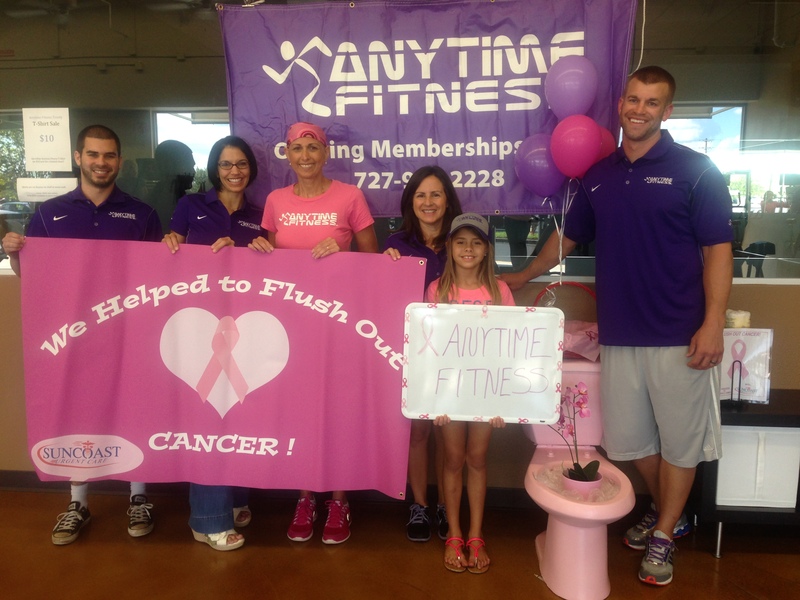 Thank you, Anytime Fitness for helping "Flush out Cancer!" October 4, 2013. 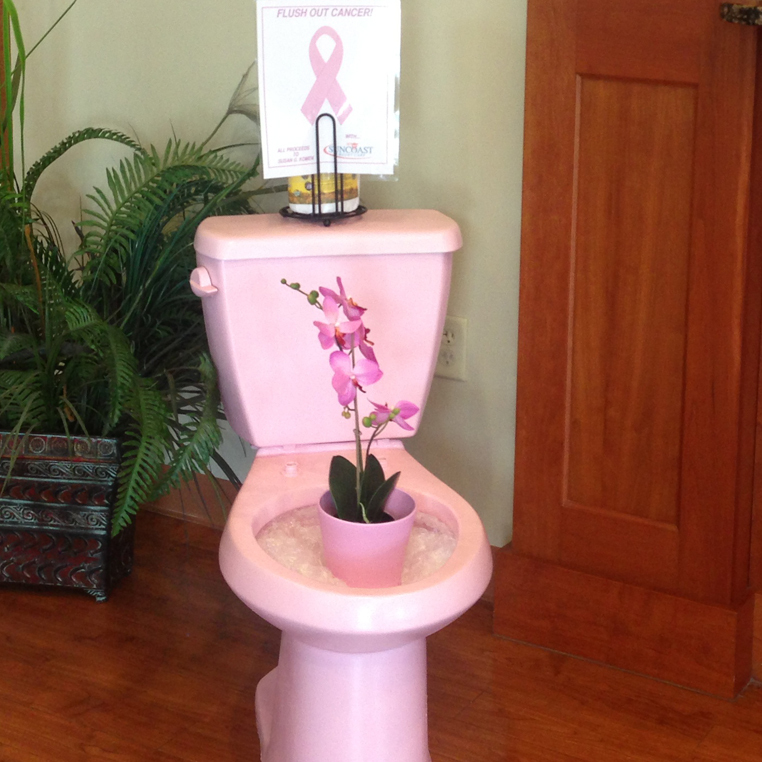 The Pink Potty at Trinity Chiropractic & Rehab on Mitchell Blvd. Thanks for joining us in the fight against Breast Cancer! October 3, 2013. 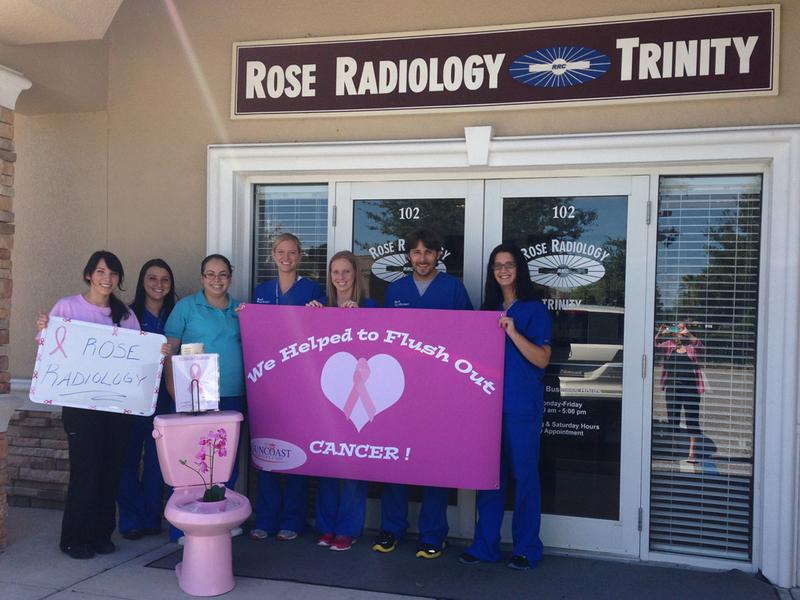 Thank you Dr. Franceschi and Smiles of Trinity Family Dentistry for helping to "Flush out Cancer! October 1, 2013. Pink Potty Paparazzi at Coastal Orthopaedics & Sports Medicine. Thank you, Dr. Candelora! October 1, 2013. 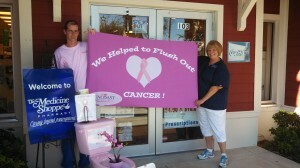 The Medicine Shoppe at Trinity Village Center helps to "Flush out Cancer!" September 30, 2013. Pink Potty at Mike's Jewelry, Trinity Village Center. September 30, 2013. 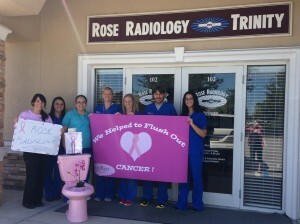 Pink Potty Paparazzi at Rose Radiology Trinity. October 2, 2013. Pink Potty Paparazzi arrives at Trinity Family Physicians! 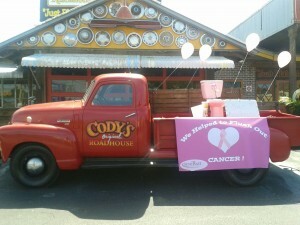 Thank you, Cody's Original Roadhouse for raising funds for Susan G. Komen and "Flush out Cancer!" 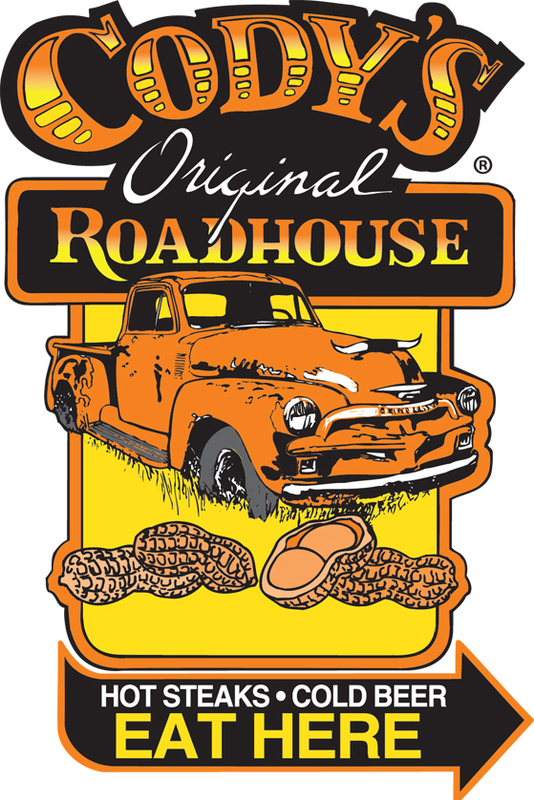 Suncoast Urgent Care would like to thank Cody's Original Roadhouse in Tarpon Springs for their efforts to help "Flush out Cancer!" 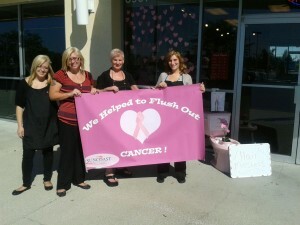 On Wednesday, October 2nd, they raffled off a $50 Gift Card and proceeds went to Susan G. Komen. Customers had a great time and there was 1 lucky winner! 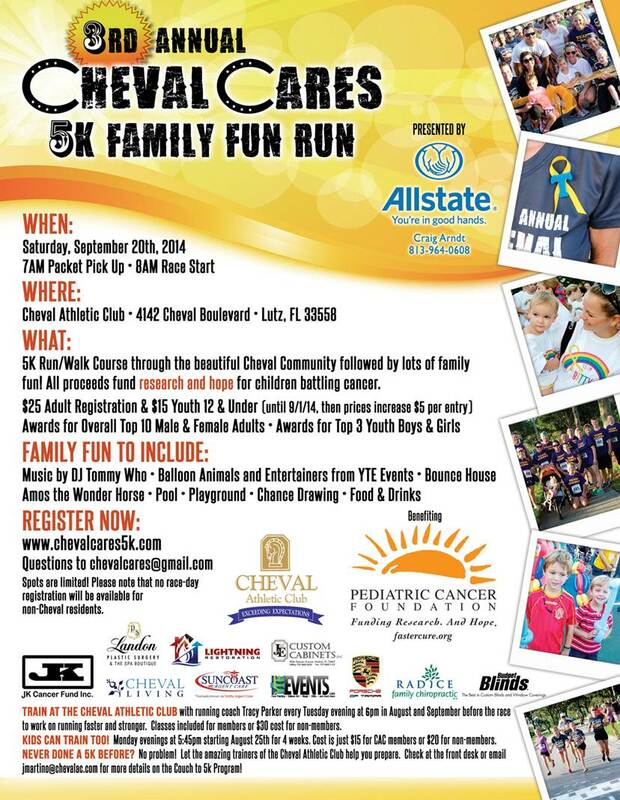 Suncoast Urgent Care sponsored the 2nd annual Cheval Cares 5K Family Fun Run 2013. It was so much fun! and the event that took place at Cheval Athletic Club in Lutz on Saturday, September 28th benefited The Pediatric Cancer Foundation. Thanks to Tabetha and Jessica for manning our booth! Tabetha and Jessica at Cheval Cares. Proceeds went to The Pediatric Cancer Foundation. Suncoast Urgent Care is proud to be a Challenger K8 Community Partner in Spring Hill. We are thrilled to be able to support an upgrade to Challenger K8’s computer lab which will help to provide enhanced academic opportunities to students. Challenger K8 Community Partners.. iMac Lab Upgrade.. to provide a technical Career Academy in Adobe and Microsoft for our students. It allows Challenger's students to earn Industry Based Certification in an onsite professional development curriculum. Students will earn high school credit and enhance student career-readiness, improve academics and help build a strong foundation for the student to continue certification at the high school level. The current iMacs that the school has are over 9 years old and can't support the software programs needed for this endeavor and others.